DRDO statement: Tejas, India’s first indigenously designed developed and productionised 4th generation plus Light Combat Aircraft (LCA) today at aroung 1100hrs achieved yet another milestone by launching an infrared seeking air to air missile that hit the target in a direct hit with precision and destroyed the target. 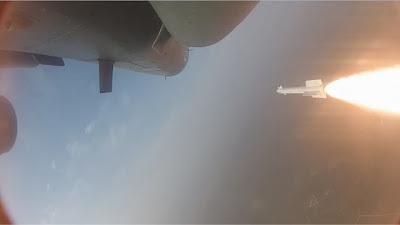 The test, demonstrating required parameters was conducted off the coast of Goa in Arabian Sea, and has taken the aircraft closer to its induction in the Indian Air Force. Tejas, one of its kind combat aircraft, has been developed by DRDO with Aeronautical Development Agency (ADA), Bengaluru, as the lead laboratory and HAL as the production partner. Shri Avinash Chander, Scientific Advisor to Defence Minister and Secretary, Deptt of Defence R&D congratulating the team said “with this launch of missile from Tejas and successfully hitting the target in the first shot, we have demonstrated the total weapon system capability of LCA Tejas”. Tejas has been undergoing weapon release flight tests, for its operational clearance. As a prelude today, Gp Capt Suneet Krishna, flying the Tejas aircraft commanded Infrared seeker missile through the fire control radar of the aircraft to lock on to the target. The target was towed by a pilotless target aircraft ‘Lakshya’ also designed and developed by DRDO’s another premier lab, ‘Aeronautics Development Establishment’ (ADE), Bengaluru developed pilotless target aircraft (PTA). The target mounted on Lakshya was launched by a ship of the Indian Navy off the west coast of India. A team from the National Flight Test Centre (NFTC), Aeronautical Development Agency, Hindustan Aeronautics Limited, ADE (DRDO), CEMILAC, DGAQA and the Indian Navy worked in perfect unison to achieve this feat. Shri PS Subramanyam, DS, Program Director Combat vehicles & Director ADA and Air Cmde KA Muthana VSM, Project Director, Flight Test supervised the operations from the National Flight Test Centre (NFTC). I am tired of achieving these milestones…. These achievements are for 'achaar' only.. as long as kickback hungry IAF/MoD officials are alive..
thats odd, weapons release testing so late in the program shows the speed at which this whole project is going. Is FOC coming this month? r-73 is fine, what about the r-27? And what about ASM like Novator? How many days she will fire R 73s ? Why not BVR. missiles . ? Good news but when is the FOC for Tejas? I know perhaps my comment would not be shown but the fact is stop all the mirage upgrades and start two more production lines for Tejas MK2 , and quickly build it and get it certified by next September. say Au revoir to Rafale and built a twin engined Tejas MK 3 with front like Rafale and both engine separated and internal weapons bay and back like F 23 and that would be way better than Rafale and lot more cost effective. Keep some workforce to enhance the capabilities of these Tejas models as F15 , F18 and. F 16 underwent multiple enhancements in subsequent blocks as Tejas MK 2 may need TVC controls as well as few more sensors to be added further up with radar and EW enhancements and all these can be done at home cost effectively not by paying 41 plus million for an obsolete non AESA radar for mirage upgrade and 100. Plus million for Rafale upgrade. I am against this looting. The air force has to think out of box and have 200 plus Tejas in Ladakh and 200 plus Tejas in arunachal in carved out hangers in Himalayas with naval prototype version and supporting carrier sized runway which is very difficult to hit by enemy and with their presence it is assured that China would never launch a successful. Attack. Japan used carriers in war instead of battleships and that was a game changer. mK3 can fly 80 to 100 thousand feet and can be used for deep. Penetration and can be launched from conventional airfields. my last comment was not published and moderated let me tell you I am retired technocrat who gets a very decent pension and just writing these comment to guide you as per my knowledge to have successful Tejas program as GE 414 IN5S6 engine is atleast two generations ahead of anything IAF is flying today and as well as Snecma engine forRafale. By the end of 2014 tejas may be inducted after IOC 2. If all goes well still….even MIG 21Bison is overdue for retirement. From 500 crores to 25000 crores. Still Tejas yet to receive IOC 1. Keep fooling the nation. at least some assurance at last that it will join IAF. I am very sure the three worthies who have posted upto now do not understand development of 'system of systems'. Further, each of them would not have achieved anything of significance at all in their lives,otherwise they would not be talking nonsense like they have done. @ Anonymous 10:49 LOL "developing system of systems" too has a deadline & time frame constraint you cannot keep developing a system of systems for two decades and flight test the systems for another 5 years & by failing to achieve required test parameters @ IOC1 & then postpone the test parameters to IOC2 & finally @ FOC they all say LCA Mk1 is under powered but there is LCA Mk2 in development to constitute LCA Mk1 shortcomings.I bet this is what we are going to hear from ADA by the end of 2014.It will take another 5-6 years for LCA Mk2 to get FOC. Mr. Sam Wise, deadlines make sense if requirements are not changed mid-way. But the IAF is notorious for doing exactly that. 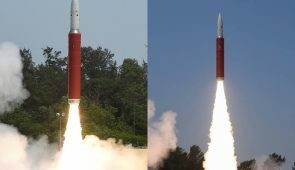 This forces the DRDO to go back to the drawing board to make changes. This is the root cause of all delays. If the IAF had a little sense, it would not have been so aloof during the development of the Tejas. It would've collaborated with DRDO at a far deeper level to get the machine they wanted. Today, the Tejas is a 4+ gen fighter jet that compares with the best in the world like Gripen C/D. The Mk-2 version is similar in proposed specs to Gripen NG (with the same GE-F414 engine). It shall also compare well with the F-16 C/D. DRDO has worked immensely hard on the Tejas in the face of technology denial regimes, sanctions (after Pokhran-2) and puny budgets. Hats off to DRDO !